While property taxes throughout Stearns County dropped by $14 million in 2002, as a result of the property tax reform done by the Legislature last summer, the reductions will not be felt equally among all property owners. Notification of 2002 property taxes were mailed in December by the auditor's office. While most properties saw reductions, some lesser-valued properties actually saw their property taxes rise in 2002. In agriculture, for instance, the lowest rates for an ag homestead (for the first $76,000 in value for a house, garage, and one-acre plot) the rate stayed the same. The lowest rate for agriculture land (up to $115,000) actually rose (from 0.35 percent in 2001 to 0.55 percent in 2002). "The higher value agriculture did okay, but the lower value stuff got hit," said Randy Schreifels, Stearns County Auditor/Treasurer. Meanwhile the tax rate for ag homesteads value between $76,000 and $500,000 dropped from 1.65 percent to 1.0 percent. The tax rate for value above $500,000 dropped from 1.65 percent to 1.25 percent. Similarly, the rate for ag land value above $115,000 dropped as well. "The higher value properties did a lot better," said Schreifels. Lower-valued residential houses also did not get any rate reduction, though all lower-valued properties benefitted from a new tax credit that applied to their overall bill, instead of specifically to their school taxes. The cities of Paynesville, Roscoe, and St. Cloud were among the few that got more state aid in 2002 than previously. "That's rare," said Schreifels. "It's kind of a mystery why that happened." 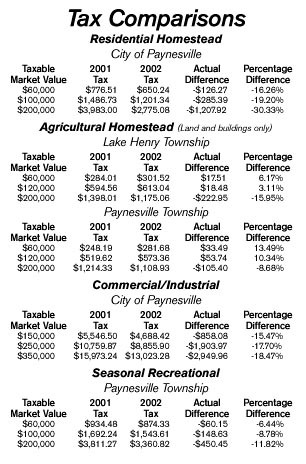 This is one reason why all homeowners in the city of Paynesville saw significant tax decreases (see chart on page 2) because the city's tax levy decreased while the city was able to add to its budget due to the increase in state aid. The $98.4 million in property taxes in Stearns County gets divided as follows: 36 percent goes to the county, 24 percent to the cities, 18 percent to the schools, 13 percent to a new statewide property tax, and seven percent to townships. The portion for schools dropped from $44 million in 2001 to $15.5 million in 2002, according to Schreifels, as a result of the state taking over general education funding. The school portion of the property taxes in 2001 was 46 percent. The statewide property tax affects commercial/industrial property and seasonal recreational property. Both got significant rate decreases (one percent or more from commercial/industrial property and almost two-thirds a percent for seasonal recreational property). Seasonal recreational property also is no longer subject to school levy referendums. One change in the property tax law could cost seasonal recreational property owners, among others, in the future. The limited market value, which limited the maximum change in assessed value to an 8.5 percent increase each year, will be phased out over five years. This means that the taxable market values for certain properties may rise even faster in the coming years in order to reach the actual assessed value in five years. That's if the phaseout of limited market value continues. "None of this stuff stays the same. It changes every year," said Schreifels. Unfortunately "it costs us money to change things every year," he added. This year, the dramatic changes in the tax law caused wholesale changes to the county's computer programs for figuring the taxes in the county. Plus the tax law changes weren't finalized until a special session in July. "The problem with them doing it so late was it was such a massive change that we had a vendor come in and make program changes," said Schreifels. The county belongs to a consortium of 55 counties that contract jointly for computer programming. "Like it or not, we have to provide services and pay for it," said Schreifels. "Like what we do here - collecting the taxes - that's really a mandated service." The next task for the county, concerning property taxes, is to prepare the actual bills that get sent in March. The first half of the 2002 property taxes will be due on May 15 and the second half on Oct. 15, except for agricultural property, whose second-half payments are due on Nov. 15.